Instructors may want to expand the final discussion to include other aspects of the carbon cycle. Prepare students ahead of time for the simulation by assigning roles and discussing rules. 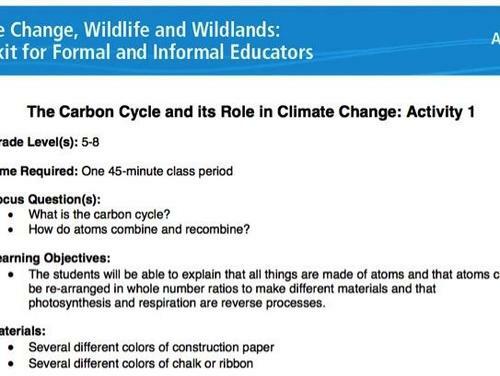 To teach the entire carbon cycle, associated activities 2 and 3 at [link http://www.globalchange.gov/resources/educators/toolkit/materials] would be very beneficial. A good assessment for this assignment might be to have students watch a video of this and summarize what is happening in the process. Model demonstrates how atoms break and make bonds in the processes of photosynthesis and respiration. A rare attempt at trying a hands-on physical model to explain important aspects of the carbon cycle. Students will likely be very engaged in this activity but it will be easy for them to lose focus. Some misconceptions are present about how bonds are created and should be addressed by the educator. Well organized and a complete resource. While this activity requires preparation of both materials and student roles, it is well worth it. Appropriate guidance before and during the activity will enable long-term learning.